I’m not crying over this comic, you are. Fangirls, Nimona has been around for quite some time. For awhile, she was a rad webcomic that I really couldn’t get into. It wasn’t anything about the story or art, I just couldn’t get into reading it digitally. I think the site was also very dark, with light pages, and I didn’t like that? Who knows. Anyways, I couldn’t get into it, so I stopped trying. Recently, though, Nimona was released as a book, so the other day I picked myself up a copy, and then read through the whole book the next day. 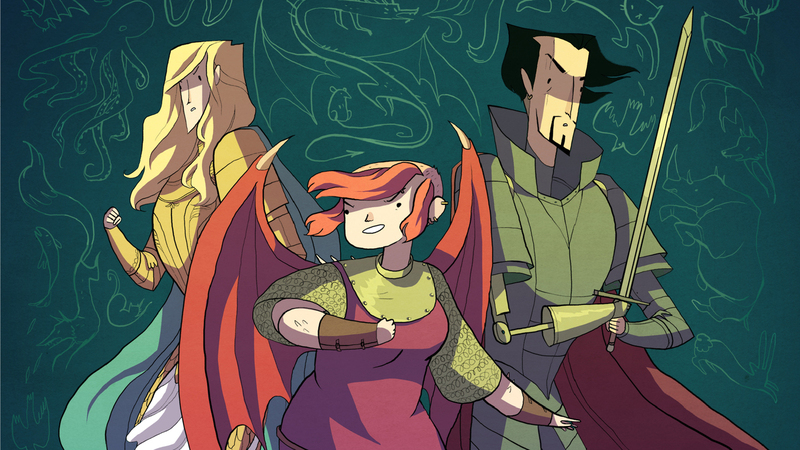 Nimona is the story of a villain, his shape shifting sidekick, and their nemesis. It’s a really neat story about corruption in government; it follows (villains name) and Nimona (the sidekick) as they work to topple said corrupted government, and reveal secrets about both of their pasts. When I first picked this up, I thought it was intended to be for all ages, but there was some mild cursing in it. Stevenson’s style does make it appear to be for children, but it’s a phenomenal book for teens and up. It’s a fun story that has friendship, cats, and a little bit of love. It is fun, and far more intense than I expected, but I don’t want to spoil it. I highly recommend this; the art is fun and very fitting to the story, and the story got me very attached to Nimona very quickly. Go grab yourself a copy of Nimona, and enjoy yourself!